E-Commerce Sellers can file their GST Returns with ease using ClearTax GST Software. ClearTax GST Software allows sellers to import Reports generated from e-commerce websites thus making GST Return filing an easy task. All sellers on e-commerce platforms can generate a monthly Sales Report from their login. Amazon Sellers can download Merchant Tax Report from their login. Similarly, Flipkart and Paytm and other e-commerce Sellers can also download the Sales Report from their sellers login. One Excel containing details of all sales. You can do this by filtering your excel (stepwise detailed explanation provided in the PPT below). Another Excel containing all the Credit Notes (goods returned). All you need to do now is upload the Excels on ClearTax GST Software. Amazon, Flipkart, and PayTM Sellers can choose the Template based on the type of Excel being uploaded. If you are a seller on any other e-commerce platform you can use our ‘Field Mapper’ to upload your Sales Reports, Map the fields and save it as a template. Once the Excel files have been uploaded on ClearTax GST Software all you need to do is review and upload the data to GST Portal/ GSTN. Want a CA to file your GST Returns? 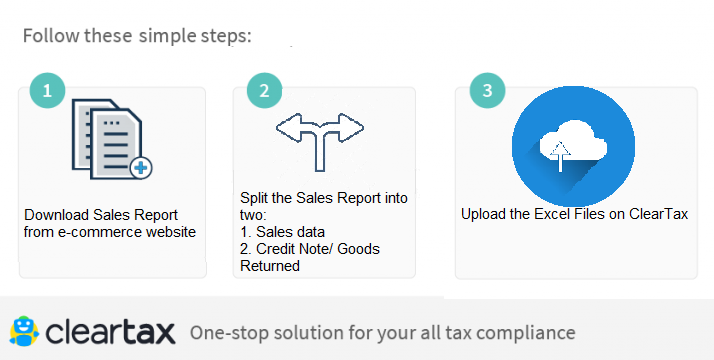 Below are the detailed guides that can help sellers download sales report and upload the Excel to ClearTax GST Software.